Within mere moments of the start of this week's sport committee hearing, Noel Rock was on his phone. He'd yet to get to ask a question, but he summarised the before and the after pretty well. His Twitter feed read: "Delay, defer, deny: the lack of answers or any clarity to Sport Ireland is absolutely disgraceful, and all state funding to FAI should cease immediately until full clarity and answers are given. This latest letter hiding behind Mazars report is insulting." Two hours on and a meeting meant to centre on the details, the insight, and repercussions around the FAI's obvious financial peculiarities - as well as their evasive behaviour regarding those - had been reduced to John Treacy talking about how sporting governance in Ireland is something to be proud of on a global scale. Meanwhile what the committee's chair, Fergus O'Dowd of Fine Gael, took from it all was the idea of "a masterplan for change in sport". In fact at times, dressed as a police dog, his barking tended to be aimed squarely at the supposed police. Over the weekend one person told us that the view within the FAI hierarchy is that Sport Ireland have no authority over them, and their funding is insignificant in the greater scheme of Uefa and Fifa money. This was proof of that attitude being well placed, rather than just bang out of order. The reality is that such a committee was only ever going to show the how behind the what. On the one hand we had Sport Ireland unable to delve into issues because they bemoaned their lack of authority, despite never asking for more. On the other we'd politicians bemoaning Sport Ireland's lack of answers despite never giving them that authority to go and get them. All the while, those in the FAI were surely giggling in fits. A problem is this governance system is allowed, by process, to be deliberately protective and ineffectual. That's not to say there aren't those within it trying desperately to chop and change, but it's like taking a butter knife to granite. Indeed years ago, in a past life working in the Dáil, what stood out was how some politicians from different sides would go for one another on camera only to break bread at lunch, and how those grilled before committees would be joking and laughing with their interrogators over pints in the bar afterwards. For many within it, perception is a whole big chunk of their politics. There's so little to take from what was largely a waste of an afternoon that Sport Ireland chief Treacy coming across as frustratingly weak appears near the top of the menu. If there was a moment to illustrate this, it was when Imelda Munster asked if he'd confidence in an FAI board that had just undermined his authority and humiliated his supposed position above them. Four times she couldn't get a yes-or-no answer. A fifth repetition of a basic query was met with, "Well, I'm not saying yes". Why such aversion to calling it as it is with a group that had just given him a run around? That of course wasn't one of the follow-ups. Beyond that instance, Treacy's general tone was difficult to accept, with Kieran Mulvey like the rock there to support a grieving widow. You wanted a reaction from him though. He had every reason to be mad, to be mean, to be demanding. Just look at the sequence of events that saw the FAI play him and Sport Ireland, stripping them bare before their spotlight moment. He admitted that a note and any detail around Delaney's bridging loan was hidden from them. When that loan emerged via the Sunday Times, they wrote on 19 March looking for an explanation. All they got was an acknowledgment of their letter, basically the two fingers of written correspondence, and this from a group they pump nearly €3m of taxpayer's money into per year. Yet all this caused them to do was write another letter, as if a guy buying a girl at the bar a drink, being ignored, so his best idea is to go and buy her another. That new letter was sent on 25 March, and coincidentally they didn't get a written response on this handed to them until 10.45am on Wednesday, just hours before this committee. Worse was the fact the wait wasn't worth it as the FAI again failed to address any of the issues. Instead they said they'd be reviewing all matters themselves and they'd write some more in time. "It doesn't provide any explanation regarding the loan or repayment," said Treacy. "And there was no legitimate reason given as to why they cannot provide this either." What he has failed to understand though is that the carrot is of little use without the stick. When queried about pulling funding until there are clear answers, he instead talked of the affect this would have on programmes and jobs. That's not their concern though, instead that should be at the door of the FAI. It's also not to say the loss of that funding wouldn't briefly hurt soccer here either, but if people had a problem the address for complaints should be Executive Vice-Chairman John Delaney, FAI, Irish Sports Campus, Snugborough Rd, Blanchardstown, Dublin 15. It's that simple. To quote Tony Montana in part, "First you get the money, then you get the power..."
Treacy and Sport Ireland appear to show remarkable trust around what they cannot possibly know. 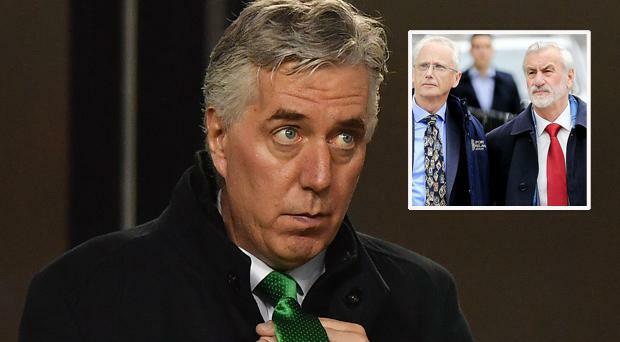 With no over-arching audit of the FAI carried out by them since 2016, and despite all that has transpired in terms of leaks and disdain aimed at them, they said that they were confident all state funding went where it should and that the €3,000 a month rent given to Delaney was an FAI matter as it wasn't their investment. "Every year auditors of the FAI send us a note saying our funding was spent on the purposes for which it was given," he explained. So his confidence is based on the FAI's auditors telling them they are spending the money where it should be spent rather than their own? It's all a little bit Irish. It's not like they don't have a clear basis to go after the FAI on either. One investment criteria for Sport Ireland is that jobs are advertised, thus Delaney's new role wasn't compliant. Treacy himself admitted as much, noting that "we wouldn't have been consulted, we don't know when the process started, what the process was, how they got to these conclusions". And it's not like they haven't been rightly firm with others who needed to be brought back into line. With the Irish Amateur Boxing Association in 2017, they were told they'd a month to put many wrongs right or they'd lose their funding. Treacy added that the bar should be higher for bigger organisations, but he and Sport Ireland set that bar. And the perception is that around the FAI, this lot don't even need to be bullied to hand over their lunch money. On it goes up the ladder. Shane Ross and his department as well as Minister for State for Sport Brendan Griffin have both failed to answer our multiple requests to speak with them, to the point Alexandra Ocasio Cortez's line seems a fantasy rather than a reality. Last month the United States representative reminded politicians, "Our job is to serve, not rule". There's been precious little evidence of that. So easy has Delaney had it that the only words uttered by him in all this were via a PR stunt in Tipperary and revolved around the difficulty of having three jobs. Immediately it brought Pádraig Flynn talking about the expense of keeping three houses. But while that ended the Mayo man, Delaney is still playing them all. One of the few remaining hopes is this was the warm-up, that Sport Ireland prove us wrong and actually get tough, and Delaney's visit to the Dáil next week will be a main event. For those on the committee are among the few left who can get some accuracy and proper detail. Otherwise we are yet again left with the feeling that the higher you climb in this society, the bigger the safety net. Their work is even done for them as key questions and discrepancies out there, with this column last week alluding to some. We didn't get answers then, but to get them on the record, yesterday we sent a new batch of questions to acting CEO and walking disappearing act Rea Walsh, women's football representative Niamh O'Donoghue, former president Tony Fitzgerald, former finance director Eamon Breen and new press officer Cathal Dervan. 1. Was there or is there any evidence that the FAI actually needed a loan? 2. Assuming it was a loan, was there a loan agreement? If so, was it with John Delaney personally or one of the companies he is involved in? Was that the same entity that subsequently invoiced the FAI? 3. Assuming it was a loan, who is authorised by the FAI to enter into loans on its behalf? Did that person or persons authorise it? What were the terms and conditions attached to it? 4. Assuming the invoice was subsequently paid, who is properly authorised to pay €100,000 for the FAI? Did that person or persons sanction such a payment? 5. The directors signed off on accounts for 2016 in May 2017. As part of that they said the business would continue as a going concern. That loan was in April 2017. Can you clarify this? Only Dervan responded, stating "no comment". Last year when John Delaney went before this committee where time is limited and therefore he can drag out the easy answers, sources have told us he left with a smile around how easy it had been. As he gets set to appear again, is there anything to fear? One person says if this was a game of chess they'd be near checkmate. After all, the plan is now to hide behind the idea they called for an audit by Mazars, and his answers will be that they await the findings. Towards the end on Wednesday, John Treacy was right about one thing. "Today is not a good day for sport and we are deeply disappointed to be in here talking about this issue with yourselves." It was a day that started with unanswered queries about Delaney's new and old jobs, it finished with questions about the work of many others. WATCH: How does Aaron Gillane's classy flick compare with five of the greatest hurling goals ever?